Acrylic domes are a surprisingly versatile and useful component of many businesses, with uses in display, decoration, visibility and even structural applications. Acrylic domes are surprisingly strong, perfectly transparent, and allow an item or display to be viewed from multiple sides clearly and easily, making them a great addition to any exhibition. In addition to this, an acrylic dome can be painted or printed with images or patterns, and two can be fixed together to make a flawless sphere, perfect for use in displays and decoration. A clear acrylic dome is usually made by vacuum thermoforming, using a hemispherical mould and vacuum pressure exerted from below to draw the pliable plastic – at its forming temperature, but no higher – down onto the mould in a perfect fit. 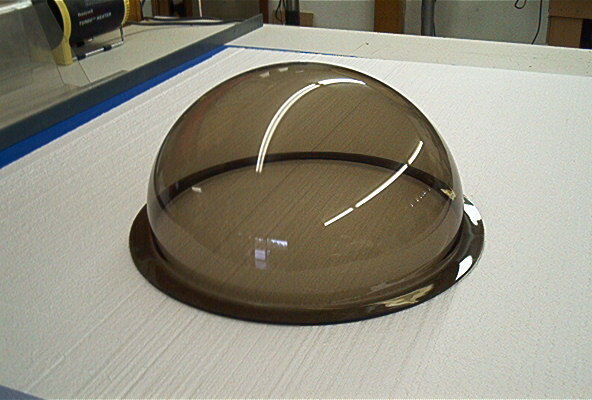 To eliminate bubbles in the material caused by evaporating liquids, the sheets of acrylic used for these acrylic domes are usually heated for a time at a high heat below their melting point, encouraging all present liquid to evaporate off before forming. In a clear acrylic dome, this is especially important, as the pockets won’t just compromise the strength of the piece as they normally do – they will also be visible as unsightly bright bubbles in the clear acrylic dome, spoiling the transparent effect. In a non-transparent dome these bubbles are still a threat, as while they compromise the strength of the material, they are also invisible. Alternative business uses for anacrylic dome include in custom installations like coin spinners and viewing ports, and they are commonly used in children’s treehouses and play areas to create a safe, all-round porthole which is tough and durable enough for even the roughest play. Art installations are commonly protected within an acrylic dome or sphere, and in some instances, the dome is the art installation, with some acrylic domes painted or frosted to create whatever appearance you want! An acrylic dome really is an endlessly versatile and useful component to a huge range of installations – the only limit is your imagination! So, if you are interested in an acrylic dome or a set of acrylic domes or spheres for your business, why settle for less than the best? The acrylic moulding experts at Signtrade can provide you with a range of stock acrylic domes up to 1800mm diameter, and even larger domes can be custom-ordered to suit your purposes. Signtrade have been at the forefront of the acrylic dome industry in the UK for decades. With their unique access to Teedy acrylic domes, Signtrade are able to provide high-quality domes at the specifications you need – whether you want them clear, painted, domes or spheres, and in any size! To get in touch with Signtrade and enquire about a quote for your acrylic dome order, you can call them on 08085 456700 at any time or visit their website, linked above! The experts on the other end of the line will be more than happy to help you find an acrylic dome solution that will fit all your needs.